Broiled chicken wings are a great dish that get the skin crispy. Treating the chicken with a glaze can add even more flavor to the dish which can please any crowd. 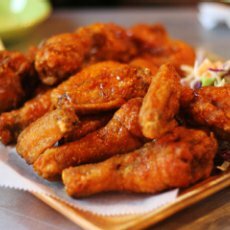 Broiling does not require any extra oil, so it also makes the dish a bit healthier than if you were to deep fry the wings. You also do not have to add any extra breading, which cuts down on calories and carbs. Preheat your broiler and line your broiler pan with aluminum foil. Spray the top of the broiler pan with the vegetable oil. Optional: add around a fourth of a cup of water. Arrange your wings on the broiler pan with the top side down. Place the rack on the highest setting under the heating coil and broil the wings for 10-11 minutes, flip and broil for another 10-11 minutes. While the wings are cooking, combine the hot sauce, butter and vinegar in a container with a sealable lid and microwave until the butter has melted. 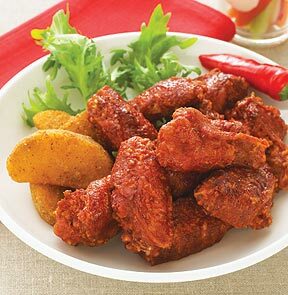 Place your cooked wings in the container with the sauce and seal the lid, shaking it a few times to coat the wings. Crack the lid every few shakes to allow the steam to escape. 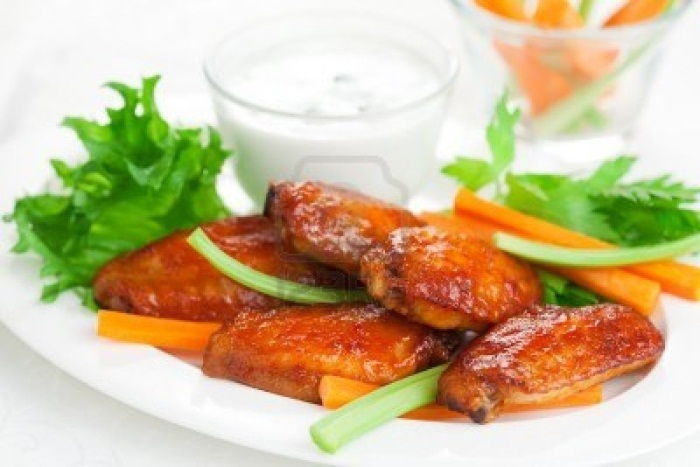 Serve your broiled chicken wings with celery and carrot sticks along with dressing for dipping. 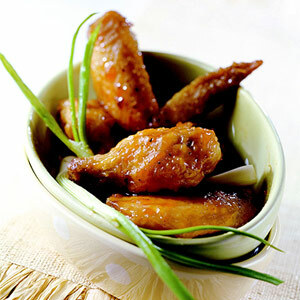 Separate the sections of the chicken wings place them in a 2 quart rectangular glass dish and cover it with wax paper. Microwave the wings for 12 minutes, redistributing the wings midway through the cooking process. Place the finished wings on your broiler pan. Melt your butter in a glass measuring cup and add the pepper sauce. Microwave the mixture on high until the butter has melted. Drizzle the sauce over the wings and broil for around 5 minutes or until they are golden brown. Cut the tips off the winds and half the remaining portions at the joint. Combine the water, garlic, soup mix and butter. Broil your chicken wings for 15 minutes turning after 8 to crisp both sides. Brush half of the sauce onto the wings, cool for three minutes, then flip and brush the other side and cook for an additional 2 minutes. Serve your finished wings with blue cheese dressing. Prepare your broiler approximately 40 minutes before serving. Place the broiler rack around 5-7 inches away from the heat source. If your oven does not have a broiler, set the temperature to 450 degrees F.
Combine the soy sauce, red wine vinegar, sugar, sesame oil, a fourth cup water and cornstarch in a 1 quart saucepan. Heat the mixture on high for around a minute or until it thickens. Sprinkle the salt and pepper on the wings and broil for 25-30 minutes or until the wings are golden brown and tender, turning them occasionally to avoid burning. 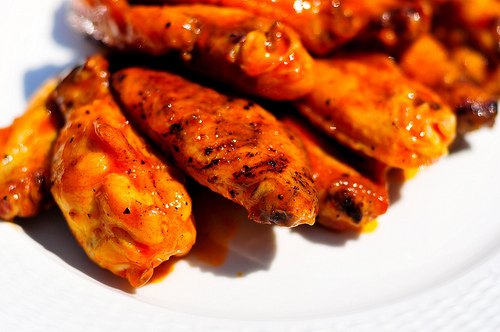 Brush the wings with the sauce in the final 10 minutes of cooking. Preheat your broiler and wash your chicken. Pat the wings dry and cut the joints, throwing away the tips. In a large sauce pan combine the beer and Tabasco sauce. Add the chicken and bring this mixture to a boil and allow it to simmer for 20 minutes until the chicken is cooked through and tender. Place the barbecue sauce in a bowl and dilute with water until you get it to your preferred consistency. Dip the finished wings in the diluted sauce and place them on a baking sheet. Broil the wings for 5 minutes then turn them over and broil 5 minutes on the other side.